워드프레스의 우커머스에서 옵션 상품을 구성하여 고객이 옵션(예: 색상, 크기 등)을 선택하여 구매할 수 있도록 할 수 있습니다. 보통 옵션 상품이라고 하면 영어로 Option으로 생각하기 쉽지만, “Variable Product”(옵션 상품)와 “Variation”(옵션)이라는 용어가 사용되므로 구글 검색 시 이 용어를 사용하면 원하는 정보를 얻을 수 있을 것입니다. 테스트로 노트북에 “사이즈”와 “색상”이라는 속성을 지정하여 가격을 달리하도록 해보겠습니다. 먼저 우커머스 속성(Attribute)을 정의하도록 합니다. 상품 > Attributes를 클릭합니다. 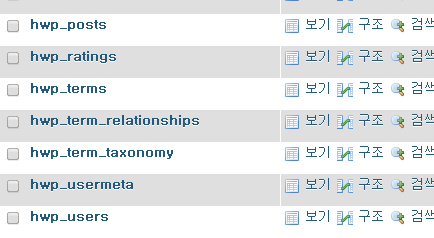 Attributes가 한글화가 되지 않은 상태로 나오네요. 한글화가 되면 “속성” 정도로 번역될 것 같습니다. 상품 > Attributes를 클릭하면 새 속성을 추가할 수 있는 화면이 표시됩니다. 적절한 속성을 추가합니다. 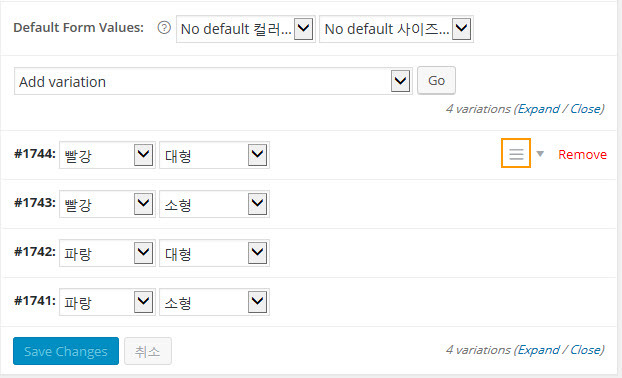 예를 들어 컬러를 추가하고 맨 아래의 “Add Attribute(속성 추가)”를 클릭합니다. 그러면 위의 그림과 같이 오른쪽 상단에 추가된 속성이 표시됩니다. 맨 오른쪽에 있는 “Configure Terms”(용어 구성?) 아이콘을 클릭합니다. 원하는 컬러를 추가합니다. 저는 “파랑”과 “빨강”을 추가해보았습니다. 위의 과정을 반복하여 다른 속성(예: 크기)을 정의하도록 합니다. 이제 새로운 상품을 추가하거나 기존 상품을 편집하여 “옵션 상품”을 구성하도록 합니다. 상품 > 상품 추가하기를 눌러 적절한 상품을 생성합니다. 상품 설명 아래의 “Product Data”(상품 데이터)에서 “옵션 상품“을 선택합니다. 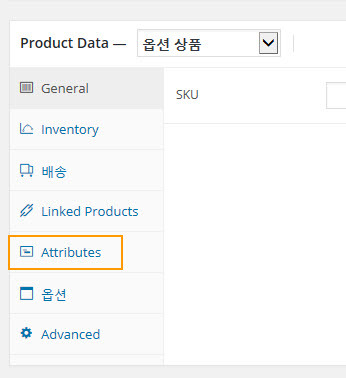 그런 다음 Product Data 아래에서 Attributes를 선택합니다. 원하는 Attribute를 선택합니다. 예를 들어, 일부 속성만 선택할 수도 있고 모든 속성을 선택할 수도 있습니다. 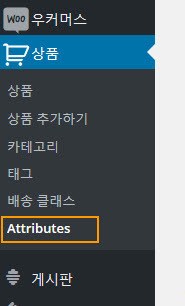 이제 Attributes 바로 아래에 있는 “옵션“을 선택합니다. 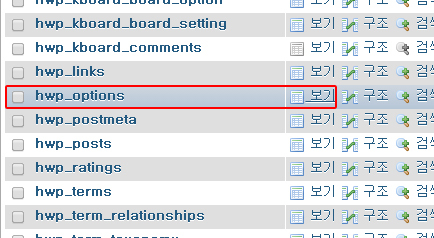 위와 같은 그림에서 “Add variation” 또는 “Create variations from all attributes” 중에서 선택하여 옵션을 추가하고 옵션의 세부 설정을 지정할 수 있습니다. “Create variations from all attributes“를 선택하면 속성의 모든 조합이 추가됩니다. 위와 같은 그림에서 개별 항목 옆에 있는 세 줄 모양의 아이콘을 클릭하면 세부 설정을 지정할 수 있습니다. 가령 개별 옵션에 대한 상품 사진을 추가할 수 있고 가격을 지정할 수 있습니다. 개별 옵션에 대하여 원하는 설정을 한 후에 발행하면 상품이 등록됩니다. 테스트로 올린 상품을 보면 아래와 같이 “컬러”와 “사이즈”를 선택할 수 있는 옵션이 추가되어 있습니다. 컬러와 사이즈를 지정하면 개별 옵션에 대해 지정한 가격이 표시됩니다. 옵션만으로 부족한 경우가 있을 수 있습니다. 고객의 특정 요구 사항에 맞게 옵션을 추가해야 하는 경우 YITH 우커머스 상품 애드온 플러그인을 사용해볼 수 있습니다. 이 플러그인을 사용하면 아래 그림과 같이 상품을 구성할 수 있습니다. 위에서 잠시 설명했지만 “variation”이라는 용어가 한글로 “옵션”으로 번역되어 있습니다. variation을 사전에서 찾아보면 “변화, 변동”의 의미를 가지고 있습니다. 즉, 동일한 상품의 다른 버전 정도로 해석할 수 있습니다. “옵션”이라는 용어는 조금 다른 뜻을 가질 수 있습니다. 예를 들어, 아래 그림과 같이 상품에 어떤 부가적인 구성품을 추가하는 것에 대하여 “옵션” 추가라는 용어를 사용하기도 합니다. 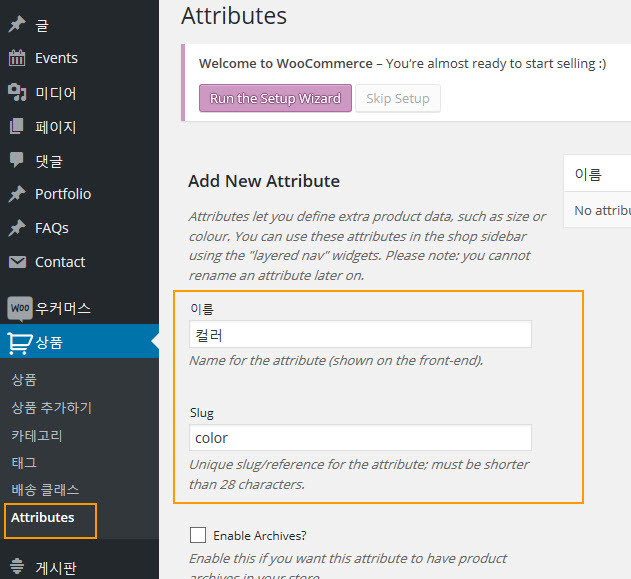 위와 같이 추가 상품 옵션(Product Option)을 추가하려는 경우 WooCommerce Extra Product Options라는 플러그인을 사용할 수 있습니다. 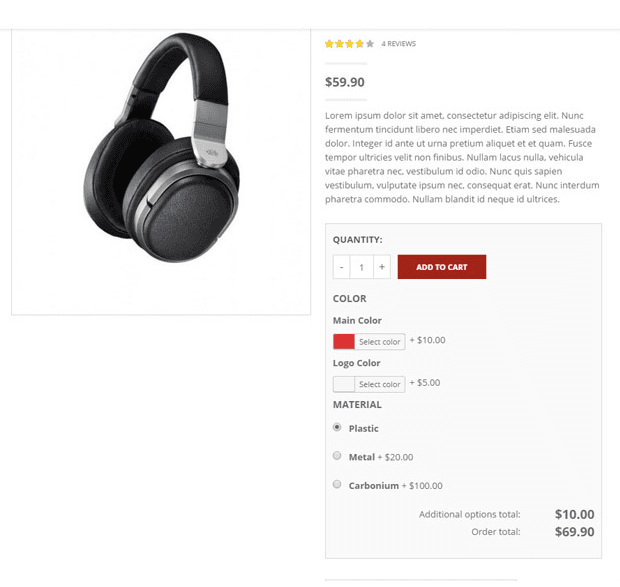 WooCommerce Extra Product Options 플러그인은 우커머스 관련 플러그인으로는 드물게 주간 베스트셀링 플러그인 목록에 이름을 올리고 있습니다. 그만큼 이와 같은 기능을 원하는 사용자가 많은 것 같습니다. 워드프레스 쇼핑몰에서 상품 옵션을 추가하려는 경우 이 플러그인을 사용하면 편리할 것 같습니다. 참고로 이 플러그인은 다음 플러그인과는 호환되지 않는다고 나와 있으니 참고하시기 바랍니다(2016년 4월 기준). 사이트에서 고객이 어떤 상품을 구매할 때 고객이 추가로 구매하기를 원하는 상품이 있는 경우 YITH WooCommerce Product Bundles 플러그인을 사용할 수 있습니다. 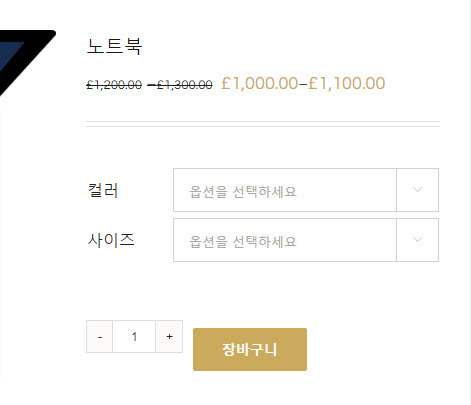 자세한 내용은 워드프레스 우커머스 상품 번들 플러그인 – YITH WooCommerce Product Bundles를 참고하세요. 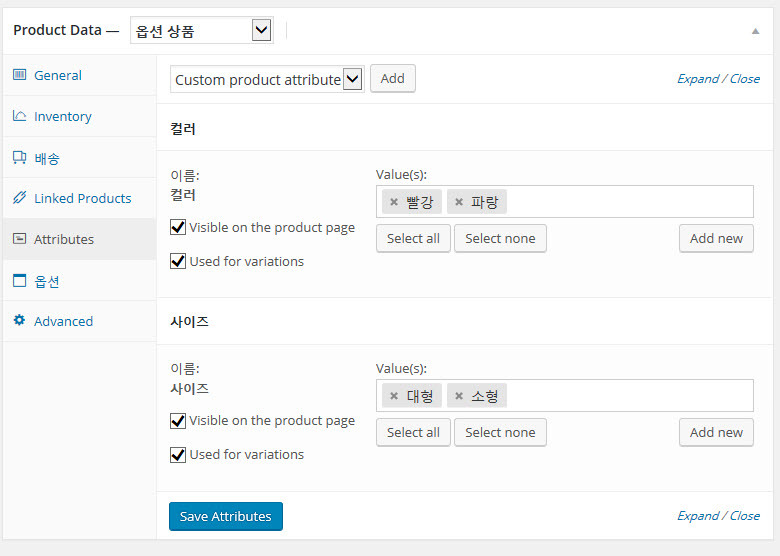 많은 상품이 있고 상품 설명, 카테고리, 가격 등을 빠르게 수정하고 싶은 경우에 YITH WOOCOMMERCE BULK PRODUCT EDITING 플러그인을 사용해볼 수 있습니다. 상품 옵션(Variation)을 지정하는 방법을 다음 동영상을 통해 확인할 수 있습니다. 영어로 되어 있습니다만, 위의 글을 읽은 후에 보면 영어를 잘 모르더라도 어느 정도 이해가 될 것입니다. 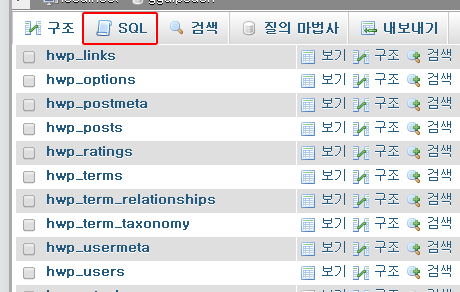 * 반드시 1번 코드를 삭제해주어야함.. 이것도 모르고 계속 같이 반영했다가 삽질..
WordPress's multisite feature offers the ability to create multiple websites from a single installation of WordPress. Each site can have a separate theme, set of plugins, and collection of content (posts and pages). This reduces the overhead of maintaining and updating several installations of WordPress, while allowing you to host multiple sites which are totally unrelated to one another. 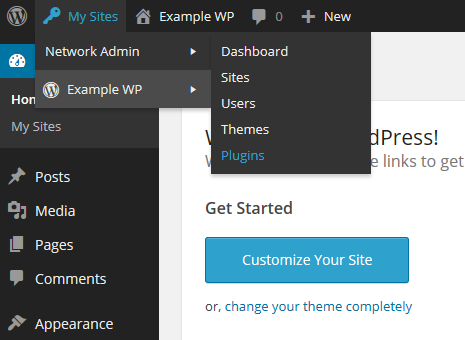 WordPress multisite comes in two flavours: subdirectory or subdomain. 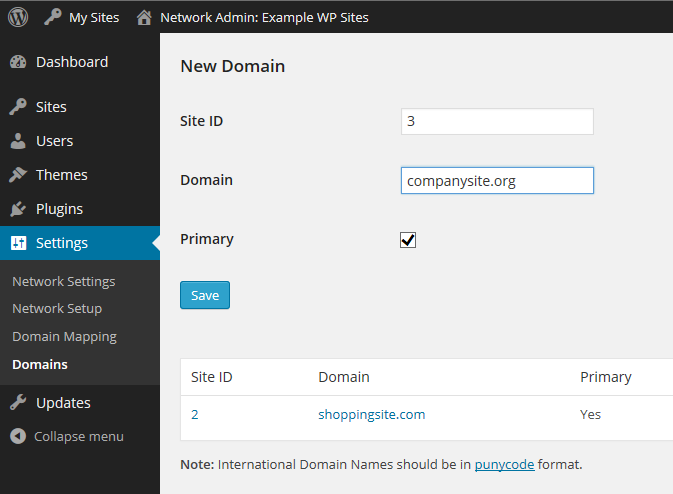 In this tutorial, we will set up WordPress multisite to use subdomains. That means that sites we create will have a subdomain web address like http://wp-site.yourdomain.com. This can be mapped to an external domain like http://wp-site.net so that each site looks independent from the outside. This is the site that is created when WordPress is installed. The first domain is the primary domain name through which WordPress will be installed. Make sure to set up DNS for all three domains to point to the IP address of the Droplet which will host WordPress. Note: This has to be done only for the *primary domain (examplewp.comin this tutorial). Log in to your DigitalOcean control panel and navigate to the Networking section. Edit the primary domain and create a wildcard A record for this domain pointing to the Droplet's IP address. A wildcard record is created by entering an asterisk (*) in the hostname input box as shown in the screenshot below. If you host your domain's DNS elsewhere, you should set the wildcard record there instead. DNS queries for any random-sub-domain.examplewp.com should return the IP address of your Droplet. In this section, we will install and configure Nginx, MySQL, and PHP. There is a detailed article on setting up a LEMP stack that you can reference if you would like to. This section will serve as a quick setup. There is also a LEMP on Ubuntu 14.04 image under the Applications tab in the Select Image section when creating a Droplet. Update the repositories and install Nginx, MySQL, PHP5-FPM and other necessary PHP modules. When MySQL server is being installed, you will be prompted to enter a password for the root database user. Please enter a strong password and do not leave it blank. You will enter the password twice. Create a document root for Nginx which will hold the WordPress files. We will use /usr/share/nginx/wordpress throughout this tutorial. We will replace Nginx's default virtual host with our own, so remove its symlink in the sites-enableddirectory. Create a new virtual host file inside the sites-available directory. This file can be named anything. In our example, we will call it wp-ms.
Edit this file and place the following configuration. Edit the text highlighted in red according to your environment. 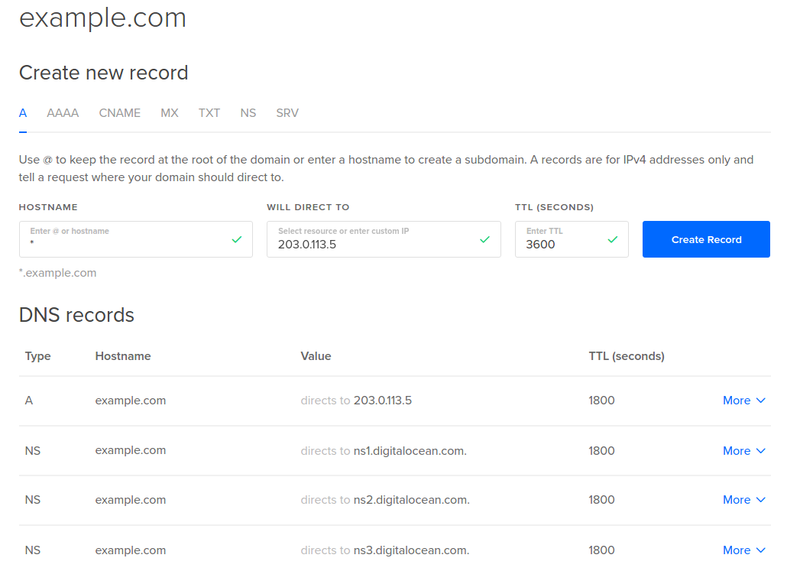 In the server_name line, you should add all three (or more) of your multisite domains, and the wildcard subdomain for the first domain. The use of the $host variable in the access_log directive creates separate log files for each domain like examplewp.com-access.log and shoppingsite.com-access.log. It is not possible to use such variables for the error_log directive, so all errors are logged in a single file. Save this file and create a symlink of this file inside the sites-enabled directory. Execute an Nginx configuration test and restart if it returns OK. 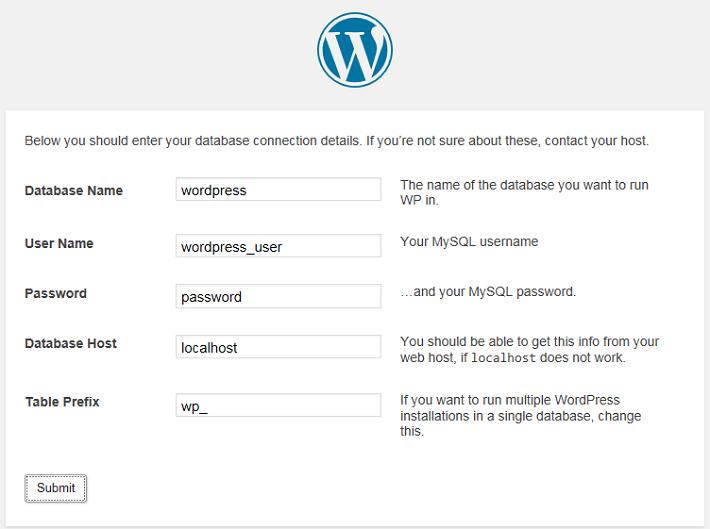 In this section, we will create a MySQL database for WordPress and a user with permissions for this database only. 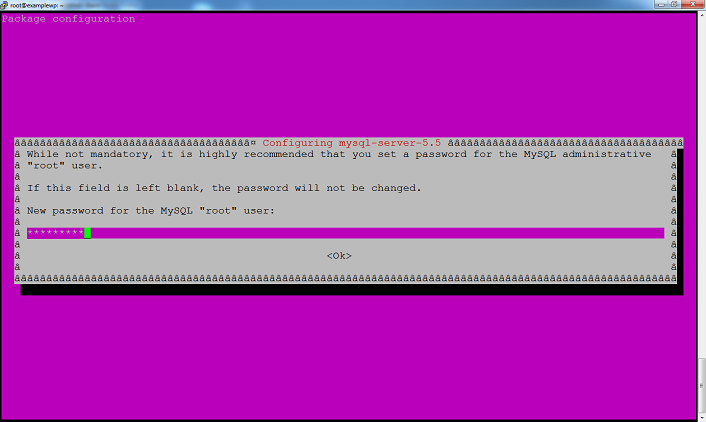 Log in to the MySQL command line as the root user. Replace the word password with a strong password. Flush the privileges and exit the MySQL command line. Note down these details as will be needing them in Step Four. More information about MySQL users can be found in this article. 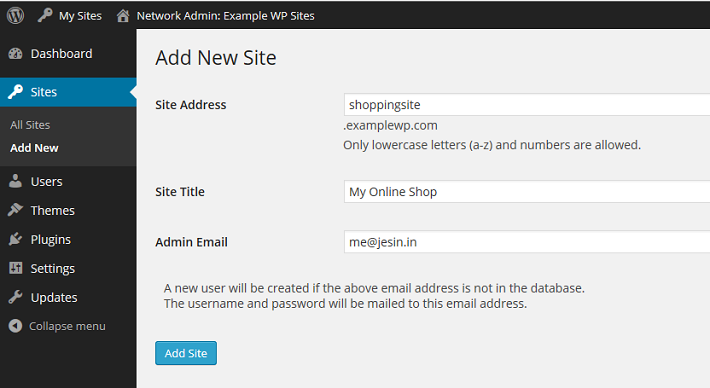 In this section, we will download the latest version of WordPress and install it. This will be for our first site, examplewp.com. Move the extracted files into the document root. Assign ownership to the user www-data. 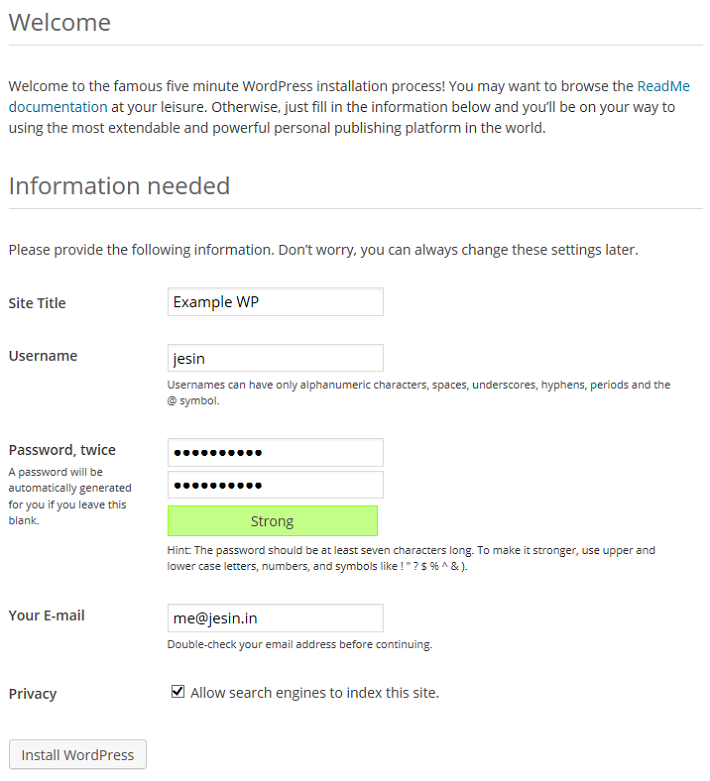 This is essential for media uploads and for core/plugin/theme updates to work in WordPress. Access the primary domain in your browser to begin the WordPress installation. You can add the "www" suffix to the URL if needed. Click the Create a Configuration File button followed by the Let's go! button. 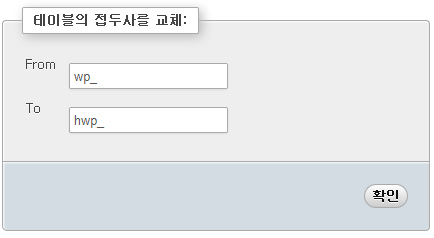 Fill in the database details (use the information from Step Three) and click Submit. 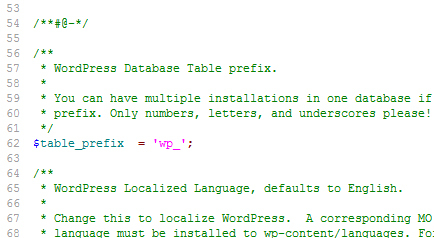 At this point, WordPress will establish a connection with the database to test the entered credentials. Once the connection succeeds, the Run the install button appears. Click on it. Complete the Information needed form to set up your site title, username, password, and email, and then click Install WordPress. It is recommended to choose a non-generic username for security. In this section, we will enable WordPress Multisite and create the two additional sites mentioned in the Prequisites section of this article. A PHP constant has to be defined in the wp-config.php file to enable the Network Setup page. We will be editing this file a few more times during this tutorial. Feel free to add all of the new lines in the /* Multisite settings */ section we just created. Save the file. Log in to the WordPress admin panel and navigate to Tools > Network Setup. Choose the Sub-domains option, modify the Network Title as desired, and then click Install. Add these lines before the comment /* That's all, stop editing! Happy blogging. */ and save it. The code displayed for .htaccess can be ignored, as Nginx does not have this file. Log out of the WordPress admin panel, and log in again. From the admin toolbar on the top left, navigate to the My Sites > Network Admin > Sites. Click the Add New button to open the Add New Site form. 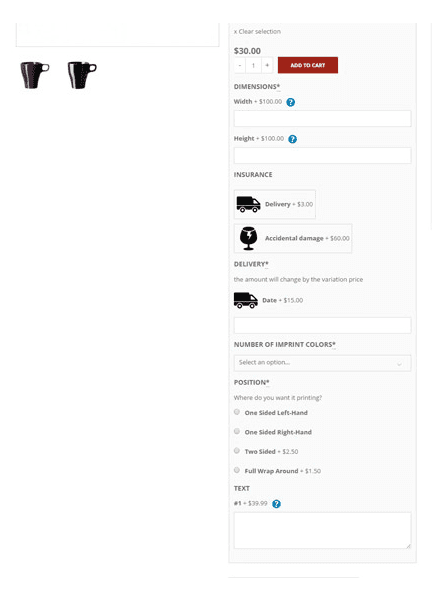 The following screenshot shows the filled-in details for the shopping site in our example. The Site Address entered will form the subdomain of this site. 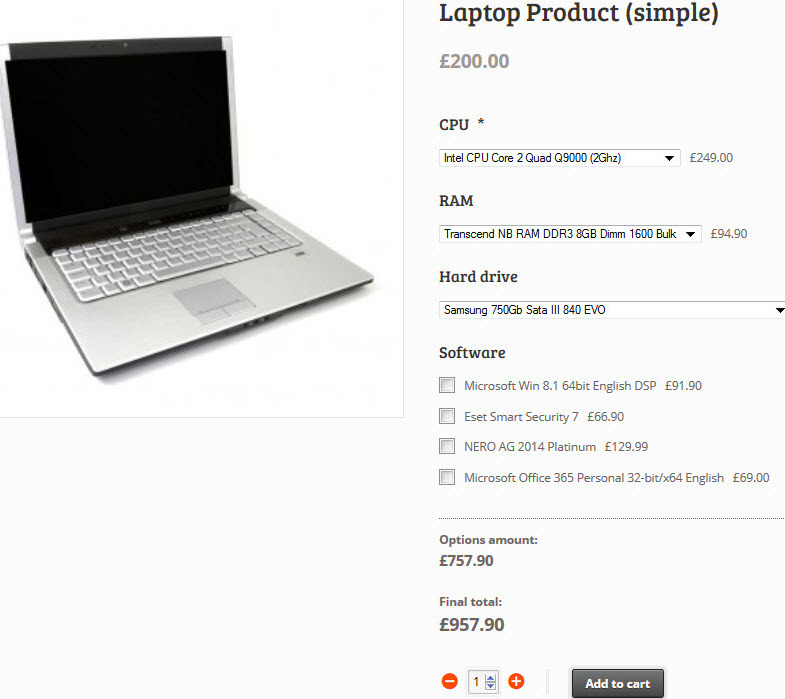 Click Add Site and the created site will be accessible via http://shoppingsite.examplewp.com. Repeat these steps to create the second site (companysite.examplewp.com in our example). Each of them will have their own content, theme, and active set of plugins. In this section, we will enable you to use a separate domain name for each WordPress site, by downloading and enabling the WordPress MU Domain Mapping plugin. This plugin allows users of WordPress Multisite to map their blog/site to another domain. Log in to your Droplet via SSH and download the WordPress MU Domain Mapping plugin. First install the unzip command, and then extract the plugin. Move the extracted files to the WordPress plugin directory. Copy the sunrise.php file from the plugin's directory to the wp-content directory. Edit the wp-config.php file and add the following line before the comment /* That's all, stop editing! Happy blogging. */. Save this file and return to the web browser. 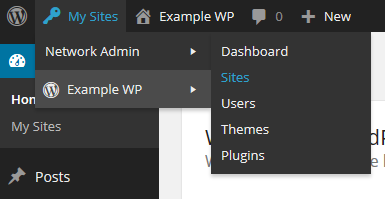 From the WordPress toolbar navigate to My Sites > Network Admin > Plugins. Click Save once done. These settings redirect all requests for subdomains (like companysite.examplewp.com) to their respective external domains (like companysite.org) including the administration pages (/wp-admin). In the next step we will be mapping a domain name to each site based on its site ID. There are many ways to find the ID of a site but for easier administration we will create a simple WordPress Must-use plugin that displays an additional ID column on the Sites page. Log in to your Droplet via SSH and create an mu-plugins directory. The Sites > All Sites section should now show an additional ID column. Note down the ID values for each site and go to the Settings > Domains page. Enter the site ID followed by the external domain for the site. For example, since companysite has an ID of 3, on this page, the Site ID should be 3, and the domain should be companysite.org. 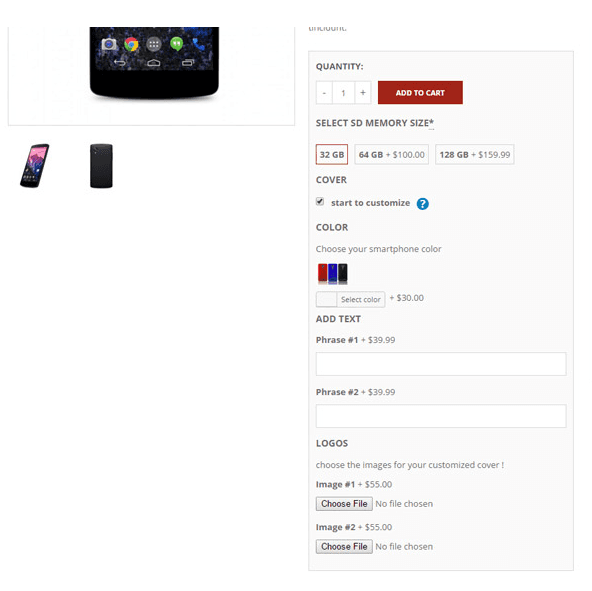 You may add a "www" prefix if you wish to set the site URL as www.companysite.org. Repeat these steps for the other domains. Click Save at the bottom of the page. Each site will have its own domain name instead of a subdomain; i.e., entering http://companysite.org in your browser will open the My Online Company Site. You can check this now by visiting http://shoppingsite.com and http://companysite.org. You should see the site title change in the upper left corner of the page. 아주 간단하게 만들어봤다. 이해는 안됨. 소스퍼가기 해서 소스 퍼간다음, 삽입! 코드에서 <!--php 부분은 알아서 수정. 워드프레스 한글언어팩에 기본 테마는 이미 곰님의 수정으로 사용하는데 무리가 없지만, 해외에서 제작된 250여개가 넘는 워드프레스 테마를 만끽하기 위해선 테마 파일의 수정이 반드시 필요하다. 코덱스에 워드프레스의 테마를 구성하는 파일들을 간단하게 설명하고 있지만, 내 나름대로, 테터툴의 스킨과 비교하여 조금은 구체적으로 파헤처 볼 생각이다. 기본적으로 워드프레스에서 반드시 필요한 파일은 기본 템플릿 파일인 index.php 이다. 테터툴과 마찬가지로 index.php 파일 하나만으로도 블로그를 구성할 수는 있다. 테마 만드는 사람 마음일 것이다. 다만, 답글까지 한꺼번에 보여준다면, 아니 보여주지 않고 숨겨놓더라도 파일을 읽는데 소요되는 시간은 상당할 것이다. 즉, 파일의 크기나 트래픽량의 증가는 감수할 수 있다면, index.php 파일 하나만으로도 상관없다. 이런 이유에서 워드프레스에서 또 하나의 중요한 파일이 single.php 이다. 파일명처럼 글 하나를 볼때 사용되는 파일이다. single.php 와 함께 다니는 파일은 comment.php 이다. 답글(꼬릿말)이나 트랙백, 핑백의 내용을 보여주며 답글을 작성할 수 있도록 하는 파일이다. 트랙백 주소도 이곳에 표현된다. Style.css 는 구조화된 워드프레스 테마 템플릿의 시각적인 부분을 담당한다.이미지, 배경색/이미지/아이콘, 폰트 크기/색, 박스 크기/색 등 눈으로 볼 수 있는 대부분을 정의하는 파일이다. 이는 인라인 스타일을 사용하는 대부분의 테터툴 스킨과 다른점이다.Style.css를 수정하기 위해서는 Topstyle pro 3과 같은 프로그램을 이용하는 것이 편리할 것이다. 예전에 한번 비교해보니 워드프레스 기본테마의 필수 파일 3가지(style.css 제외)를 합친 것이 테터툴 기본스킨의 index.php 파일보다 크기가 훨씬 작았던 것으로 기억난다. 이는 table 레이아웃과 div + CSS 레이아웃의 차이점이랄 수 있다. 아래는 일반적으로 워드프레스의 테마에 포함된 파일 구조이다. 회사 홈페이지나 광고 사이트등 많은 사이트들의 CMS(콘텐츠 관리 시스템)로 쓰이고 있습니다. 워드 프레스는 뛰어난 확장성을 갖고 있기 때문에 플러그인이나, 테마등을 개발하여 적용하기 좋습니다. 유료로 돈을 주고 살 수 있는 경우도 있습니다. 워드프레스에 관리자 기능이 있습니다. 여기에 워드프레스 관리를 위한 다양한 메뉴가 있습니다. 이 관리자 메뉴에 우리만의 관리자 메뉴를 추가하고 싶을 경우 어떻게 해야 할까요? 우선 플러그인 파일을 워드프레스 설치 디렉토리의 wp-content 디렉토리안으 plugins 폴더에 추가하셔야 합니다. 디렉토리를 만들어서 추가하는 것이 좋습니다. 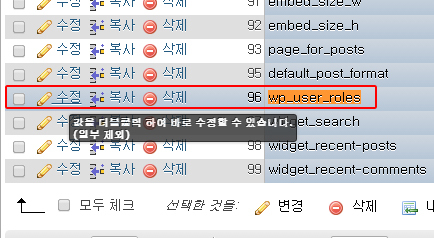 wp-content\plugins에 wdm 이라는 디렉토리를 만들겠습니다. 그리고 wdm 디렉토리 밑에 plugin.php 라는 파일을 만들고 다음 내용을 넣습니다. 위처럼 작성하면 가장 위의 주석 부분을 워드프레스가 파싱하여 플러그인 목록에 보여줍니다. plugins에서 plugin이 잘 추가됐는지 확인합니다. 그리고 우리가 추가한 plugin을 사용해야 하므로 active 합니다. 그러면 관리자 메뉴 중 가장 아래에 추가메뉴와 서브메뉴가 추가된 것을 확인할 수 있습니다. 코드를 설명하면 다음과 같습니다. 우선 가장 아래줄의 코드 의미를 봅시다. 사용하겠다는 의미입니다. 그러면 wdm_menu를 봅시다. 메뉴 추가 함수의 자세한 사용법은 해당 함수 호출의 주석 부분의 url을 참고하세요. 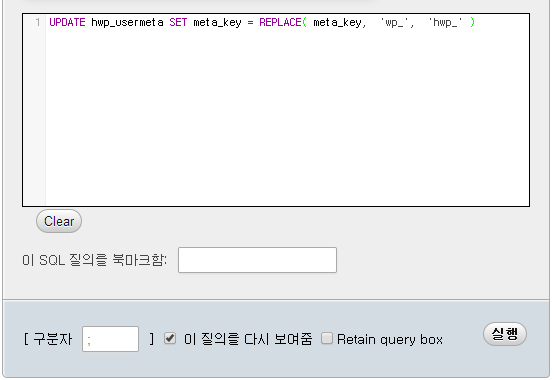 호출할 function으로 "screen1"과, "screen2"를 지정합니다. 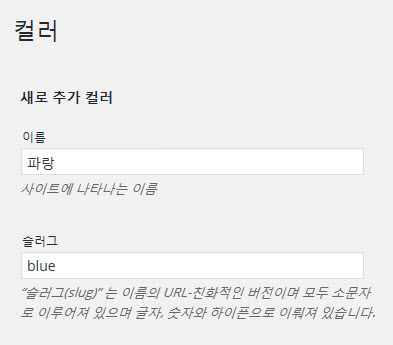 이렇게 하면 해당 메뉴를 클릭했을때 각각 screen1()과 screen2() 가 호출됩니다. 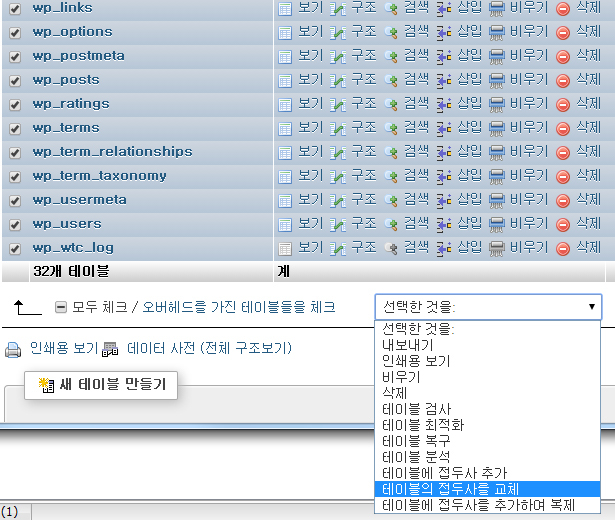 서브메뉴를 클릭하면 screen2.php 를 포함하여 보여줍니다. 같은 디렉토리에 올리면 admin의 메뉴에서 구현한 화면을 볼 수 있습니다.